Long Story Short (LSS), I am SICK AND TIRED of wearing a bunny bun every single day. So, I've been researching lots of really cute, everyday or go-out, up-dos, and what I am finding is AMAZING. 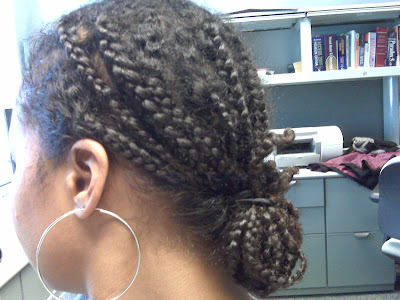 *Side #1 - See my past blog on Protective Styles to figure out why I'm wearing my hair in this said bun. I have already tried a little something something the other day and am planning on doing a few more to add to a cute little up-do blog. *Side #3 - Here's a recent pic of me and JaNelle. JaNelle with her wave-iron style, and me with my regular wash-and-go. **I am still a Karen's Body Beautiful addict!! **I am no longer co-washing. I find my hair and scalp does better if I just wash. If I'm going to wear my hair out, washing gives it more body and movement. Co-washing can actually weigh my hair down, even with the lightest condish. **I am still bunning. My hair is in a bun most days, hugely due to laziness. It's easy. It's cute for work. It's classic. It's protective. I love it. I wash when I feel like my scalp needs it - usually every 4-6 days. I don't put washing on a strict schedule. I use Karen's Body Beautiful Ultimate Conditioning Shampoo and Deep Conditioner, then put on a bit of Karen's Super Silky - my hair has that great 'seaweed' feel with just a dime-sized amount of Super Silky. Then I use a tiny dab of Aubrey Organics B-5 gel or Oyin Handmade Shine & Define on the front of my hair and twist it back in a bun. I also wash if I'm going to wear my hair out (which I don't do nearly as often as bunning), even if my scalp isn't saying, "Wash me!!" My wash-n-go is truly a 'wash'-n-go. A fresh wash is necessary. I use the same products, but detangle with a large tooth comb in the shower before rinsing out the conditioner, and apply Aubrey Organics B-5 gel all over my hair (after the Super Silky) before letting it air dry. I can get 3rd day hair, and wash on the 4th. After wearing my hair out it feels more dry than when bunning, so following 3rd day hair, I leave all of the conditioner in and let it sit while my hair is in a bun as a lazy deep conditioning treatment (if I am returning to a bun, which I usually do). I also have to detangle thoroughly after wearing my hair out for a few days. If I am going to straighten (really rare), I wash with Karen's Body Beautiful Herbal Conditioner and condition with her Herbal Conditioner. Afterwards, I apply a very small amount of Super Silky on the ends only. So that's it. For the most part I listen to my hair. If it feels on the dry side, I don't rinse out my conditioner, just bun it up with the product in there. From time to time I will also use a heavier product than Super Silky, either the Sweet Ambrosia (formally known as Hair Milk) or Hair Nectar, but ONLY when bunning. Pic 1 - 3rd day wash-n-go hair - traveling and tired!! 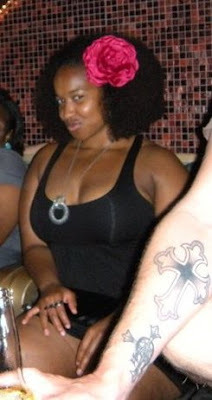 So, on a few occasions this year, I have decided to take my natural to another level and rock a classic afro. The idea started as something fun to do for a 70's party, but I liked it so much that I was constantly looking for an occasion to do it again. Did you know that The Afro dates all the way back to the 1860's? Get this - There were a group of women called "Circassian beauties" -- "A fairly extensive literary history suggests that Circassian women were thought to be unusually beautiful, spirited and elegant, and as such were desirable as concubines" (oh snap!). Further, these Circassian beauties originated from the Northern Caucus region, the region where the concept of a Caucasian race was developed. So, yes ... if you are following me, the original afros were rocked by Caucasians! Now, if you know your history (like I do now thanks to Wiki), the term "Caucasian" is historically used to describe the entire population of people from the regions of Europe, N. Africa, Horn of Africa, W. Central, and S. Asia, in relation to physical type and not necessarily skin tone. I'm starting to digress a bit, but what I'm trying to say is that the Afro dates way back than what I thought, AND it was worn by the original Caucasians, who I would not say were "white" but have come to be associated with that today. 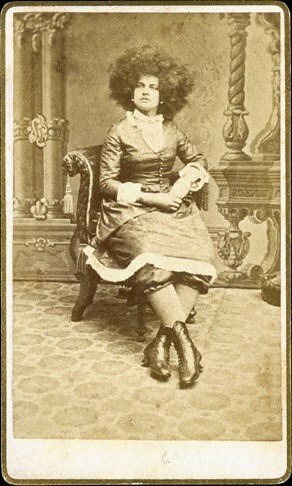 Here's a pretty hot pic of one of these Circassian Ladies rockin the fro (what they called "Moss Hair" back then). First - I must mention that my hair is Type 3C, so I'm not thinking I could simply pick my hair out and it would mold into a perfect fro of my liking (though, maybe I'll try this once). So, to obtain my Diana Ross Fro, I use a blow dryer with a comb attachment. And given the damage that constant blow-drying can create, I only do the fro look every now and then. And there you have it! History of the Afro, and my Afro, and I love it! Happy Fro Styling! Power to the People! Curlisto Method - This style was introduced by the Curlisto Product line, so of course they suggest you use their products, but I'm thinking this can be done with any leave-in/hair milk, hair cream, and gel of your choice. I'll probably try this with a base of KBB Hair Milk, then apply one of my hair creams with Aubrey's B5. 3. Apply a mix of cream and gel to each section, from root to tip, running fingers through and shaking the ends to stimulate your curls. 4. After applying all over, put duck bill clips in the roots of your hair (down the middle and one on each side), kind of lifting up the roots. 6. Curlisto suggests you apply their "Unruly Paste" to smooth any fly aways, then apply a glow spray and some other stuff, but not sure if you really need to. I don't like to mess with my hair too much after it's dry. Curlisto - Sounds Cool. Perhaps I'll try this on a weekend or day off, because who has time to diffuse until dry. Really. Braid-Out/Twist-Out - This style is exactly what it sounds like. Basically, you would braid or twist your hair in sections (after applying some product all over), as small or big as you like, let your hair dry, then carefully take each braid/twist out. Then fluff to your liking :) ... My rugby twin Ashley does this and her hair look gorgeous when she does. I like it. I might do that. Ooh look she cut her hair! 1. I have realized that I NEED MORE OILS in my hair. UPDATE: Well, back when I wrote this, it was the beginning of March and still pretty chilly outside. Because of that, I needed to put a lot of oils in my hair. BUT - now that it's June and humid, I don't need as many oils. In fact, if I accidentally go crazy with some of my oil-based products, my hair usually comes out VERY greasy and not cute. Conclusion - I was definitely successful in using more oils. I've used organic coconut oil, Karen's Jojoba oil, & an assortment of Anita Grant's oils and I love them all. I just don't need to use them as often in the summa-time. 2. I will do an all over oil treatment to my hair at least once a week. UPDATE: Again - Back in March I was really good at keeping this up. But as the weather got warmer it wasn't needed. Maybe once every 2-3 weeks these days. Moisture is still important!! 3. I will wear twists or braids, perhaps put up into a bun, at least once a week. UPDATE: Sooooooo.... I started off REALLY good at keeping this up. 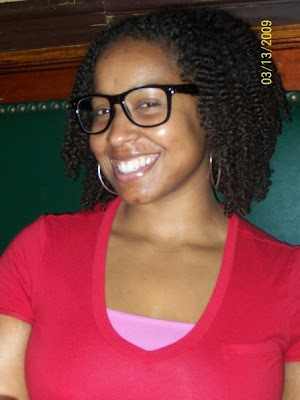 It was perfect because I had rugby games every weekend, which gave me more motivation to do braids or twists or whatev. But sadly, since rugby had ended, I have been very delinquent on my protective styles. I need to read my own blog about this to remind myself of the benefits and get back to it!!! 4. Use Aubrey's B5 Gel. UPDATE: Got it and Love it Love it Love it!! For anyone willing to try it - it's called a "gel" but its not really a gel. This stuff holds my curl beautifully without the scrunchy hard feeling of a traditional gel. A little dab'll do ya, because I've had the same bottle for MONTHS now and I use it almost everyday as a top coat after applying my other products. Especially on hot, humid days. Loveit! UPDATE: Hmmmmmm..... I want to say that I have TRIED a few different styles occasionally (side parts, hair pinned differently), but I seem to always come back to my part down the middle. I just think it looks best that way. I also like to pin up a little piece to the side after my middle-parted hair is dry, like at the end of the day or something. But that's it. I still need to be more creative. Someone help me! 6. Hair Does NOT Have To Be Perfect All The Time! UPDATE: Negative Ghostwriter. I still have an obsession with perfection. Yet, I still have people telling me I need to let it go and be wild and big and decent.... just hasn't happened yet. I think the problem is I use so many products in my hair that weigh them down to perfection. If I try not to use products, I gain volume, but I also think it looks frizzy. I need to do more research in this department. So, looks like I'm about 3 or 4 out of 6 for the above goals. Not too shabby. Overall, I would say that I am SO happy with my hair right now. After a good trim about 2 months ago, my ends are healthy, my curls are gorge (gorgeous), and my hair is soft to the touch (not greasy), yet it still looks shiny. I can definitely say that my hair is at least 10 times more healthy than it was a year ago, before I went truly natural (products, etc...). But anyway, the moral to this story is that I just recently started to try more Protective Styles on my hair. For a simple definition, Protective Styles are any type of hair style that protects your hair from being exposed to the air and snagging/rubbing on your clothes. As I was looking at other women's blogs and seeing how beautiful and healthy their hair was, it was evident that ALL of them wore their hair in Protective Styles most of the time. 1. Helps your hair to accumulate length. 2. 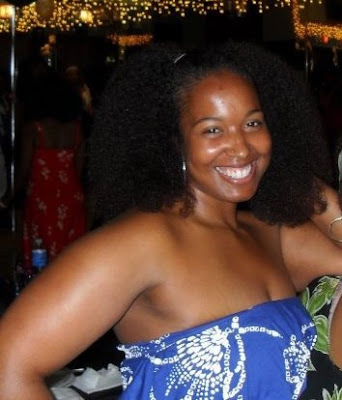 Locks moisture into your hair (Especially when I use natural oils when doing my style! I like using Organic Coconut Oil). 3. Keeps it from drying out - gotta keep those oils in for them to work! 5. Needs less combing and brushing (which can lead to split ends). 6. You can keep a style in for days, and it's ok!! !